The rally organized by ACP recorded a real flood. Participation records were break due to 94 car teams present, and 25 Buggy Teams too. All together, were joined by over 400 pilots, who have encouraged the 16th edition of this competition, considered the closing party of the TT Championship in Portugal. Among the 43 teams who used Fedima products, the main emphasis was the Vodafone BP Ultimate Team. Known Pilots such as, Jose Pedro Fontes, Miguel Barbosa, António Coimbra, Luis Silva and Nicolas Clerget had a perfect start that began with the fall of the lap record during heat training laps with less than 10 minutes. This result ensured this Team departure for the race in pole position, which was followed by 24 hours of excellent management of the car that led to the triumph in the end. 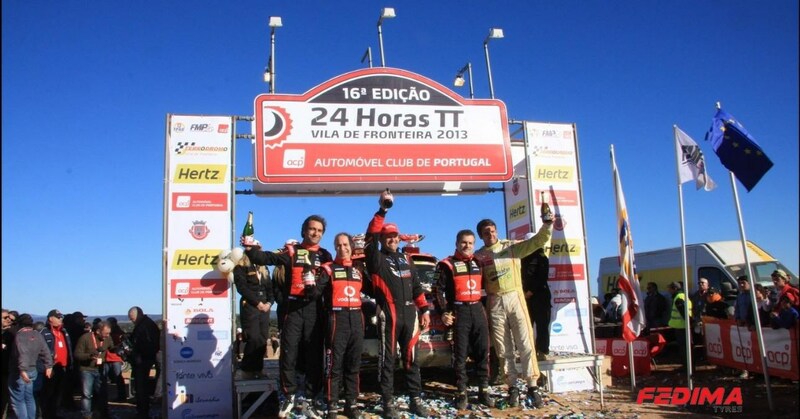 The team chose for their participation Fedima F/Power in 205/90R16, performing 24 hours a total of 110 laps of the circuit, traveling about 1900 kilometers. During the race winners only didn’t led for 5 hours , at which point the team of Mario Andrade AC Proto Nissan also equipped with Fedima F/Power in 235/85R16 , took command . However, bad luck would knock on the door of the Portuguese pilot based in France team, which after a tough battle with the BP Ultimate Vodafone team, would suffer mechanical problems in the Proto overnight.